Golden Cherry Casino is no longer available . Click here for alternative casinos . 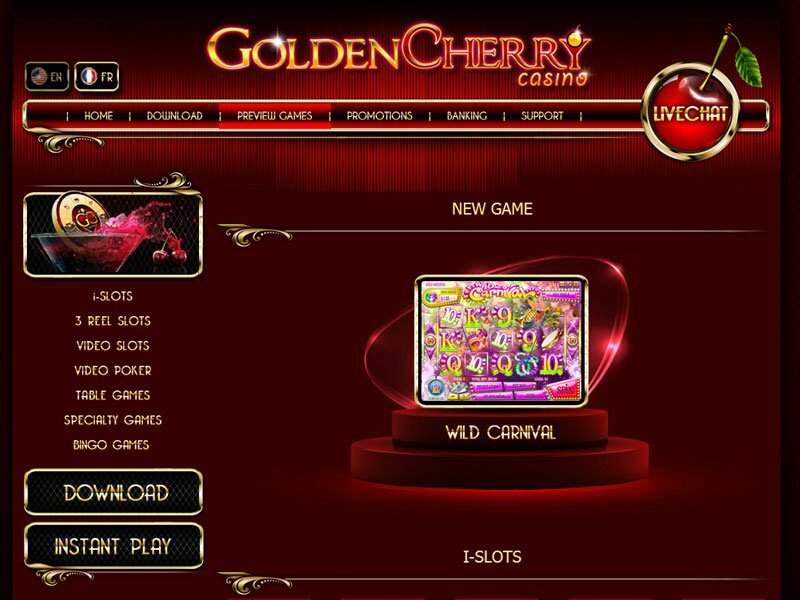 Golden Cherry Casino provides little in terms of quality, but if you’re looking for a slightly different gaming experience and not to mention software with quite an appealing design, Golden Cherry is a great place to check out. The majority of the American online gambling market is controlled by popular casinos running on Real Time Gaming. Every so often players can get a breath of fresh air with a new casino that comes with different software and therefore a new gaming experience. Though there are better casinos and gaming software on the market, Golden Cherry online casino provides relief from a long string of casinos that seem to offer the same games and same experience. 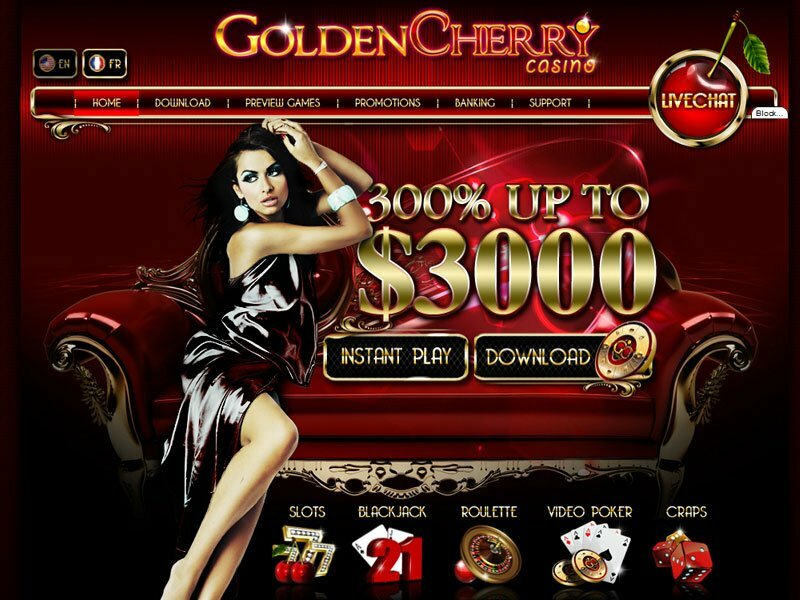 Golden Cherry online casino is located in the British Virgin Islands and runs on Rival gaming software which will be unfamiliar to some particularly in America where Real Time Gaming is widely used and marketed. Rival gaming software adds a healthy selection and slightly different approach to online gambling to the overall internet market. Graphics are mediocre and the sound effects and background music detract from the overall feel and enjoyment of game play, but game functionality is dependable and innovative themes make up for the average quality of the software. Online slot machines are the most abundant option at Golden Cherry and include a strong choice in i-Slots which provide fun storylines like the golf themed slot series that starts with ‘Hole in Won’ and continues to part II: ‘The Back Nine’. All other classic casino games are also offered by the Rival gaming software and table games like Roulette and the strategic Black Jack are unique for the size and clarity of the chips, betting squares and playing cards making the game easier on the eyes. 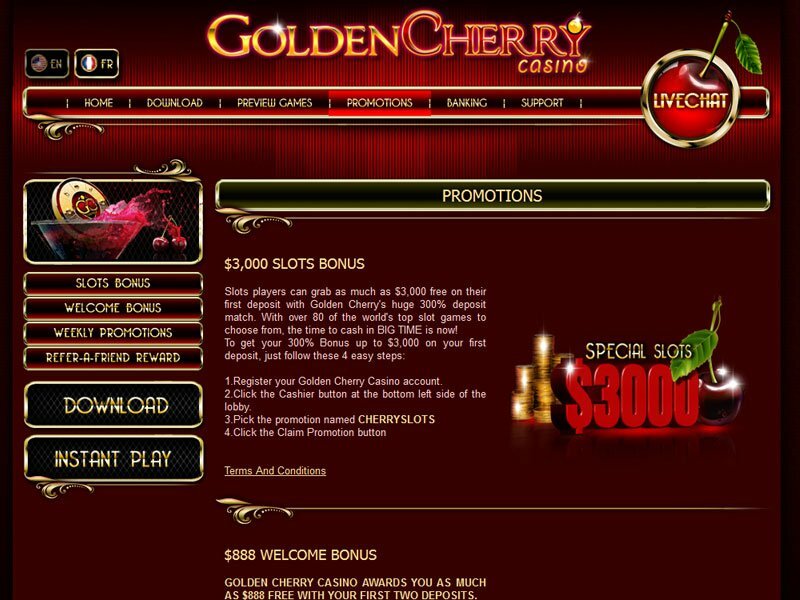 The Golden Cherry Casino bonus opportunities are few in comparison to some competitors. They do however smartly offer a special bonus for slots, which promotes good business as slots are by far Golden Cherry’s most attractive quality. The other promotions include a traditional welcome bonus of which I’ve seen better and worse, special weekly bonuses and an extra handout if you bring a friend in to start gambling at Golden Cherry online casino as well. Golden Cherry also offers the easiest and most common ways of both depositing and withdrawing money. Perhaps the only banking resource that is a point of disappointment in this Golden Cherry Casino review is the lack of Paypal as an option. This means that while they do accept American customers, anyone in the U.S. will not have the same comfortable opportunities that an eWallet provides. Even if gaming could use a bump into the 21st century, I can speak from experience in saying that customer service at Golden Cherry is available 24/7 as advertised and responses are quick and professional. - Relatively new software therefore new games etc. One of my favorite things about this casino is the refer a friend bonus! I received $50 for getting a friend of mine to sign up! It’s great!